A recent study reveals that between you and your pals, one of you is likely carrying E. coli in your pocket. 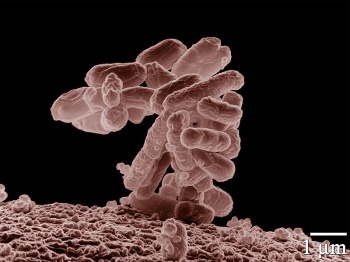 Most strains of E. coli are perfectly natural and safe, at least when they stay in your intestines where they belong. It's actually one of many bacterium located in the lower intestinal tracts of humans and animals, and is pretty handy to have around. E. coli helps the body produce the much needed vitamin K, as well as stave off other, less beneficial bacteria from claiming real estate in your innards. Some strains, however, aren't quite as friendly. They can cause food poisoning, bowel troubles, and sometimes even death in young children. If you represent the unfortunate 16.67% of people pressing E. coli against your ear every time you call your Aunt Milley in Hoboken, that doesn't (necessarily) mean you've been taking your life lessons from Pig Pen. People transmit this and other foul germs all of the time by shaking hands, touching public railings, kung-fu fighting, and reaching into the same bag of jumbo pretzels. Still, it has to start somewhere, and the fact that such a high percentage of cellular devices are currently covered in the stuff implies that there are more than a handful of people out there not washing up after using the restroom. I'm not sure what the point of this global study was, other than to inform us that we are very, very dirty. While that shouldn't be news to anyone, I always appreciate it when researchers use science to remind us of the lessons many of us seem to have forgotten since elementary school. Wash those little fingers and thumbs, children! Also, not to sound alarms, but I'm starting to wonder how many console controllers currently share the same bacterial fate. We'd better go home and give them a good scrubbing just to be sure.